In what only can be described as a bizarre political action, Senator John Tester announced his plans to “introduce” the CSKT Compact to the U.S. Senate. In so doing, he is directly pressuring the citizens, legislature, and judiciary of Montana, notifying us that state law doesn’t matter after all. In other words, let’s ignore and not wait for the current legal challenge to the constitutionality of the legislature’s vote on the Compact in court right now. Why not ignore all the other pending lawsuits on the compact after this first ruling? It doesn’t matter what any state legislature, law, court, constitution, or the citizens of Montana say: the federal government through Tester will also seize control over the legal and state decision-making process as well. Tester’s submission of the alleged CSKT Compact is premature, improper, and a blatant disregard for the Montana and U.S. Constitutions. It reeks of the cynicism, arrogance, lawlessness, untruthfulness, and sheer “power-over” attitude we have come to expect from the the Montana state executive, democrats, fake republicans, FARM, the CSKT, and the federal government under the Obama and Bullock/democrat administrations. These entities have the deepest pockets, but are devoid of basic moral authority to advance the CSKT Compact. Tester’s actions are desperate, defiant and show contempt for the rule of law. Tester is on a fools errand which will likely bring him huge embarrassment sooner rather than later. The basic spin of course is that Tester doesn’t think he needs to follow or respect state law in favoring his Tribal constituents over every other Montana citizen. Opponents in the Legislature last year criticized the bill’s supporters for arguing that because the compact was a previously negotiated settlement between three parties, any amendments to the bill at the state level would require negotiations to start fresh. In truth, the compact supporters actually threatened that any change–even minor word changes–would require a do-over of the whole process, starting it all over again. But this was not true, as changes could have been made and were proposed over the course of the 2013 and 2014 sessions that would have enabled broad support. But those changes were never incorporated. Compact opponents in the legislature attempted eleven (11) amendments that would have addressed the compact’s significant shortfalls. Both Senator Chas Vincent and Representative Steve Fitzpatrick implemented the Governor’s blind allegiance to a compact that harms Montana citizens, using the threat of litigation, having to start the process all over again, and ignoring the laws and constitution of Montana to force compliance of citizens. And in the end of course, never winning the argument for the Compact, the legislature’s compact proponents had to change the rules, and violate the constitution in order to pass the CSKT Compact. The CSKT Compact appears to be a political game that is being played at the expense of the Montana and U.S. citizenry. It never was and never will be about an honest settlement of the water rights of the CSKT. the Compact did not quantify the Tribes’ water rights, it took all the water under the thinnest of legal reeds. It will never be a fair deal for U.S. or Montana taxpayers. Only one obvious statement here: go for the $2.3 billion and scream like hell when they cut you to “only” $1.2 billion, the amount you really want. Really? Yawn. I’m so scared sleepy. And for any Tribal members, you must understand that none of this money goes to help the individual Tribal member or family—it goes solely to enrich the corrupt Tribal leadership and their attorneys. Some of that money will probably make it into the campaign coffers of Tester and other politicos. Now the Astroturf FARM advertising makes sense at this time. The million-dollar FARM propaganda campaign, including mailers, flyers, newspaper/radio advertisements, and phone calls were designed to “condition” the public mind and prejudice Congress. FARM’s role is to create the appearance of large public support (money spent, flyers mailed out, phone calls/surveys, etc) in the eyes of Congress and the 2017 Montana legislature. There are other reasons why this FARM advertising is underway–and that is to influence the upcoming 2017 legislature. If the compact vote is ruled unconstitutional, and that ruling upheld, this propaganda is designed to condition the the 2017 legislature that just a few “tweaks” are required and the CSKT Compact will be just fine. No one ever said these compact proponents, claiming to “bridge partisan barriers” through this CSKT Compact, didn’t have strategy. Their efforts have been brazen and forceful; almost contemptuous in the one goal of passing this compact. But no one expected them to be so blatant about taking your property rights! There must be a lot of money, position, power, and promises riding on “getting the thing introduced into Congress in 2016” or “fixed” legislatively in 2017. This is, after all, the last term of Obama. But Tester’s actions are a fools errand, an empty political promise. Tester may have paid off whatever debt he owes to the CSKT by this silly and embarrassing action, but he has already lost his 2018 bid for re-election. 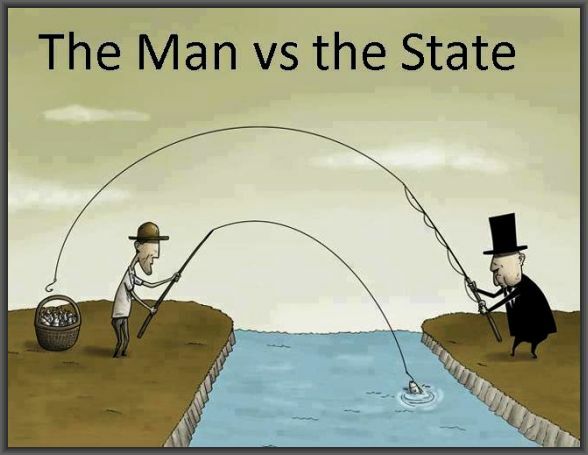 Whatever the fruits of your labor, the government is working behind your back to take them. Its too bad, but very clear, that the state, tribal, and federal governments have degenerated completely and have lost the consent of the governed. Remember that Montana state legislators have already notified Congress, including the Montana Congressional Delegation, Interior Secretary Sally Jewel, and all relevant congressional committees of the legal status of the CSKT Compact and its extensive legal problems which will be litigated before the Compact leaves Montana. You can write to each of these committees and individuals at the addresses listed on the letters above, and let them know of the inappropriateness of Senator Tester’s actions. Let these people know you oppose the destruction of western Montana through the CSKT Compact! Reading between the lines and signs, I suggest that there is an element of psychological warfare underway–having utilized all the proper legal tools and public participation avenues to set forth relevant concerns, the “establishment” simply ignores the rules, the laws, the people. Combined with the attack on the FJBC again by the compact proponents, the FJBC election fiasco, and now simply ignoring the legal reality is an assault on everyone. On the eve of Memorial Day, they choose to dishonor the sacrifices of those who enabled America. Shame! Tester is showboating. The compact has NOT yet been finalized with Congress. I’ve been told it can’t be introduced in the House until it is. It would need to be introduced in the House to go into effect. And the House committee chairman has said the [sic] ain’t gonna happen this Congress. Maybe we all should put up the replies we get from all three Con-men? Memorial Day is not a holiday. It’s to remember and pay tribute to all those who fought and died to protect our rights. The same rights that this govt is incrementally regulating out of existence.